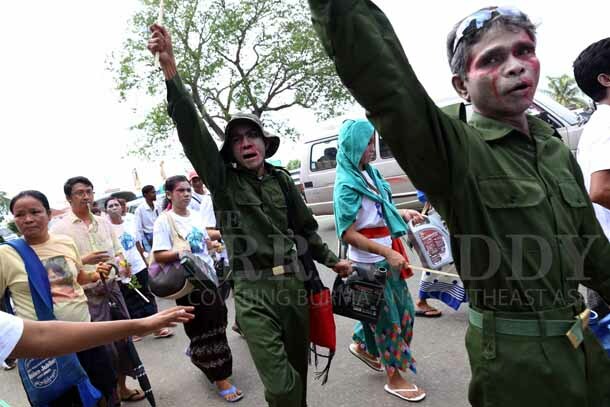 RANGOON—Men dressed as dead soldiers pounded oil cans like drums on the streets of Burma’s commercial capital this weekend, creating a beat for dozens of activists marching peacefully to protest the long-running conflict in the country’s north. The drummers’ faces were painted white, with streaks of red dripping down their cheeks, as they walked across Rangoon with about 75 activists on Sunday, exactly two years after a ceasefire broke down between the government’s army and ethnic rebels in north Burma’s Kachin State, displacing about 100,000 people. The march in Rangoon came about two weeks after the latest round of peace talks in north Burma which were seen as the most productive yet, with a preliminary peace deal—but not an official ceasefire—signed between Kachin rebels and the government. Pedestrians watched as the procession made its way through five townships on its way to Rangoon’s Zaw Tanar Ya Ma Buddhist Monastery, where internally displaced persons (IDPs) and religious leaders spoke about the conflict. Some of the activists dressed in military fatigues and others wore T-shirts with peace signs, while monks in saffron robes carried flowers and wreathes. Outside the temple, a display of photographs showed communities in Kachin State that have been destroyed by the fighting. A piece of installation art depicted the conflict in a more abstract way, with plastic toy soldiers encircling a large figure that held a trophy, other figurines lying mangled and bloody on the ground, and toy helicopters dangling from strings above. The artist, Zoncy, said the piece was inspired by recent visits to IDP camps in Kachin State. “I wanted to visualize how the war is and how the war is going to affect the people there,” she said. The conflict in Kachin State began in June 2011 after a 17-year ceasefire broke down between the government’s army and the Kachin Independence Army (KIA), a rebel group fighting for greater political autonomy and basic rights for the Kachin people, who, like most minority groups in Burma, were long oppressed by the former military government. Fighting escalated in January of this year, with the government’s army launching offensives and air raids despite a call from President Thein Sein for a unilateral ceasefire. Peace talks began in February and fighting has since died down, although tens of thousands of people remain displaced in IDP camps. In the most recent round of talks, in the Kachin State capital of Myitkyina, both sides agreed to a preliminary peace agreement. The seven-point agreement was not a ceasefire, but it marked an important step toward ending the clashes. Both sides agreed to “undertake efforts to achieve de-escalation and cessation of hostilities” and to “continue discussions on military matters related to repositioning of troops,” according to two points from a translation of the agreement. For Kachin State native Khon Ja, also from the Kachin Peace Network, the march in Rangoon was intended to demand accountability from the government for the war. Of the event’s highlights, she said an interfaith prayer service at the temple with Buddhist, Hindu and Muslim leaders was particularly moving.